For the second consecutive year, Sam Houston State University has made the list as one of the best colleges in the nation to work for, according to a new survey by The Chronicle of Higher Education. The results, released Monday (July 25) in The Chronicle’s fourth annual report on The Academic Workplace, are based on a survey of nearly 44,000 employees at 310 colleges and universities. In all, only 111 of the 310 institutions achieved “Great College to Work For” recognition for specific best practices and policies. Results are reported in two classifications: four-year institutions and two-year institutions. Within each of the classifications, there were three groups, based on total undergraduate and graduate enrollment—small (2,999 or fewer students), medium (3,000 to 9,999) and large (more than 10,000) institutions. “Honor Roll” recognition, for four-year colleges, was given to the 10 institutions in each size that were cited most often across all of the recognition categories. SHSU won honors in three categories this year: job satisfaction; work/life balance; and confidence in senior leadership. Employees also rated SHSU highly enough to be recognized in the following categories: facilities; workspaces and security; supervisor/department chair relationship; and respect and appreciation. “The recognition is especially rewarding because it is based on the feedback of our faculty and staff—those individuals whose daily efforts ensure the success of our students,” said SHSU President Dana Gibson. The survey results were obtained from a two-part assessment process: an institutional audit that captured demographics and workplace policies from each institution and a survey administered to faculty, administrators and professional support staff. The primary factor in deciding whether an institution received recognition was the employee feedback. In addition to the Great College To Work For designation, SHSU was selected earlier this year by The Carnegie Foundation for the Advancement of Teaching to receive the 2010 Community Engagement Classification. 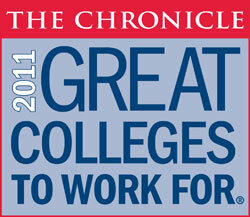 For complete survey results, see http://chronicle.com/section/Great-Colleges-to-Work-For/537/.